It’s up for debate who got beat worse Saturday night, Matt Hughes or the Vancouver Canucks. While Hughes was knocked out by B.J. Penn just 21 seconds into their bout during UFC 123, the Canucks were smacked around for seven goals by the Chicago Blackhawks in a 7-1 loss at Rogers Arena. At least the Hughes/Penn fight was over before it started. The Canucks, returning home from a five-game eastern road trip, never got going against the Blackhawks and because of it they were embarrassed in their most lopsided loss since April 5, 2008, a 7-1 drubbing at the hands of the Calgary Flames. “It was 0-0 after the first, obviously we had a chance to get our legs under us and we really don’t have an explanation for what happened after that,” said Roberto Luongo, who was pulled for the second time this season after giving up four goals on 20 shots. Fernando Pisani scored twice and Brent Seabrook, Patrick Sharp, Jonathan Toews, Troy Brouwer and Patrick Kane added singles as the Blackhawks scored four goals in the second period and three in the third to hold a commanding 7-0 lead before Mikael Samuelsson gave Canucks fans something to cheer about with his fourth goal of the season to break rookie goaltender Corey Crawford’s shutout bid. Dating back to the 2010 NHL Playoffs, Chicago is now 4-0 in Vancouver with the Blackhawks having ravaged the Canucks for 24 goals. After an uneventful opening 20 minutes in which shots were even at 2-2 with eight minutes to play and finished 10-7 for the Blackhawks, the middle stanza began as a carbon copy before Chicago hit the scoreboard. Toews gave the Blackhawks a 1-0 when he got position on Alex Edler and re-directed a Marian Hossa point shot past Luongo. Three shots later Chicago held a 2-0 lead. Brouwer gathered speed down the left wing and with a step on Christian Ehrhoff, he cut on goal and wrapped the puck around an outstretched Luongo. With 6:12 remaining in the third, Chicago extended its lead to 3-0 off a Seabrook blast from the point on the power play and Sharp finished off a miserable period for Vancouver scoring with less than five minutes to play to end Luongo’s night and put the Canucks on ice. The third period saw Cory Schneider give up three goals on 21 shots before Samuelsson scored on the power play for Vancouver. Odds are the night wouldn’t have been such a wash for the Canucks had their power play gotten the best of the Blackhawks early. Vancouver failed to take advantage of a pair of power plays in the opening period with only one shot to show for. “When you don’t get a shot on the PP, it kills your momentum and we’ve got to be better,” said Ehrhoff, who was minus-2 on the night. 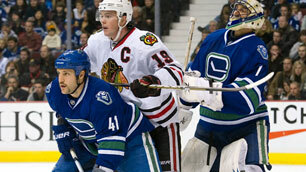 The Canucks were also guilty of taking too many penalties of their own as the Blackhawks were treated to over 14 minutes of power play time. 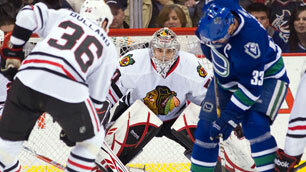 Luckily for Vancouver, Chicago could only convert on a single man advantage finishing 1-for-7. "That's way too much,” said Alex Burrows of Vancouver’s seven penalties. “They weren't only bad undisciplined penalties, we were too late, we were slow, we had to hold them down, we had to trip them. That's what happens when you're not skating." The silver lining of a loss in the first of back-to-back games is that the Canucks have a chance to right the ship at home in less than 24 hours when the Phoenix Coyotes come to town. “You never feel good after these types of games, so I’m sure a lot of guys will go home and think about it and lose a few hours of sleep, but we’ve got a big game tomorrow and a good chance to rebound,” said Kevin Bieksa. “That’s the only positive thing about tonight is that we can come back right away tomorrow and show that we are better than this,” said Ehrhoff. Keith Ballard sat out Saturday’s contest with the flu; Saturday night’s loss to the Blackhawks was as forgettable as games come for every Canuck except Joel Perrault, who made his Canucks debut after being recalled from Manitoba Friday; this was the first game this season Vancouver lost when being outshot, the Canucks are now 5-1-1 when outshot.